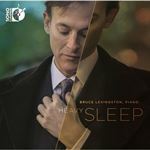 Bruce Levingston’s new CD, Heavy Sleep, for many listeners might be variously pleasing and perplexing. The disc presents a kind of new-age/retro premise for connecting works of J.S. Bach (original keyboard compositions, as well as transcriptions by more recent composers) and quite recent compositions by Timo Andres and Mohammed Fairouz, these getting a world premiere recording. In a booklet note, Levingston states that for him, “each work on this album relates either directly or spiritually to the theme of death, rebirth, or both.” Not everyone will be so sure of such a connection regarding the Bach works, though it comes across loud and clear in the contemporary ones. Andres’ Heavy Sleep is essentially a study in mood and textures, with strong echoes of Debussy’s more atmospheric Préludes (such as La Cathédrale engloutie) as well as some of the darker, more dramatic Nocturnes by Chopin, and occasionally the languorous filigree from Chopin’s Barcarolle. Running a bit longer than eight minutes, the work will engross some listeners, but it may induce an actual heavy sleep for others. Fairouz’ very dramatic El Male Rachamin, inspired by Ligeti, is a more lively work, a five-movement study in contrasts of texture and voicing which more than once alludes to Ligeti’s Musica Ricercata, II, best known via Stanley Kubrick’s posthumous film Eyes Wide Shut. In the third movement, “I, who brought corpses from the mountains…”, Fairouz uses a persistent left-hand bass motif to support a right-hand Perpetuum mobile. The next movement, “I, who use but a tiny portion of words from the dictionary…”, functions as a single line recitativo which might seem gimmicky, but it has genuine impact and is arguably the highlight of the entire disc. The finale, “I, who am forced to decipher riddles…”, not surprisingly is a question/answer game, almost a loose homage to the opening of Chopin’s Scherzo No° 2 in B-flat minor. The numerous Bach works are interesting primarily because of Levingston’s richly idiosyncratic playing, which is a far cry from the more brittle and über-contrapuntal playing which, in varying degrees, has become fashionable since Glenn Gould brought Bach back into mainstream piano performance repertoire some sixty years ago. Offhand, the one parallel with Levingston’s persona I can cite would be Sviatoslav Richter’s recordings of excerpts from The Well-Tempered Clavier from Richter’s 1962 Italian tour, released by Deutsche Grammophon Gesellschaft a few years later. Levingston brings a soft, gentle perspective both to original works and to transcriptions. His approach to the opening phrases of the Chromatic Fantasy and Fugue is fleet and light, even feathery. But this is not lightweight playing: he brings a tremendous range of dynamics and sonority even within such an approach and it is Levingston’s playing, more than any other factor, which underscore the connections he cites among the various works on this CD. The Bach-Siloti Prelude in B minor is slow and meditative, but never dull, and the same can be said for the Prelude and Fugue in B minor, the final work from The Well-Tempered Clavier, Book 1. Similarly, the Kurtág transcription of Gottes Zeit ist die allerbest Zeit is dreamy yet intelligent. One final word of praise is merited for the sumptuous Steinway grand, model D (New York) number 590904, an instrument of glorious sonority and texture which I could imagine either Arthur Rubinsten or Vladimir Horowitz gladly selecting in past decades. If every new Steinway was this good and so perfectly regulated – kudos to technician John Veitch – classical pianists would not be fleeing in droves to Bosendorfer, Fazioli and Yamaha as is continuing to happen. The master for this digital stereo disc was made in 7.1 surround, with engineer Daniel Shores, and there is no hint of the obviously false ‘reverb’ which so many recent piano recordings have shown, and which is as artificial as it is annoying. While the promotional premise for Levingston’s Heavy Sleep may be subject to debate, the music and performing on this CD are admirable, and very fine.